UK artist Mark Van Hoen is producing electronic music since 1981. He played bass guitar and synthesizer on the superb Seefeel’s “Polyfusia” album, one of the seminal bands of the ’90s. He works under his own name and worked as well under the Locust moniker. Now he lives and works in Los Angeles. This record was composed and recorded in Los Angeles in 2016, inspired by Philip Jeck, Simon Scott, Daniel Menche, Lee Bannon, Kara-Lis Coverdale, Pye Corner Audio and Marcus Fischer, who were on tour west coast in the USA, alongwith Van Hoen. In the meantime our protagonist was recording the album he was editing and making sound design for films, which influenced the structure to the album. Several of the titles on the album were influenced by the reading he made in those days of the apocalyptic Edgar Allan Poe’s short story “The Conversation of Eiros and Charmion”. Van Hoen with his modular synthesizers, sound design software, piano, guitar, organ, field recordings and library sounds, is the instrumental and sound sources that make up the seven pieces on “Invisible Threads”. The strong cinematic nature of the music suggests images at all times. Ambient atmospheres transport to intimate and cozy spaces. “Opposite Day” is a good example of this, where the organ notes are suspended in the air and keep resonating. On “The Yes_No Game” emerges a female vocalist whose singing emerges from the background. “Aether” with its subtle melody conjure up composer Angelo Badalamenti. 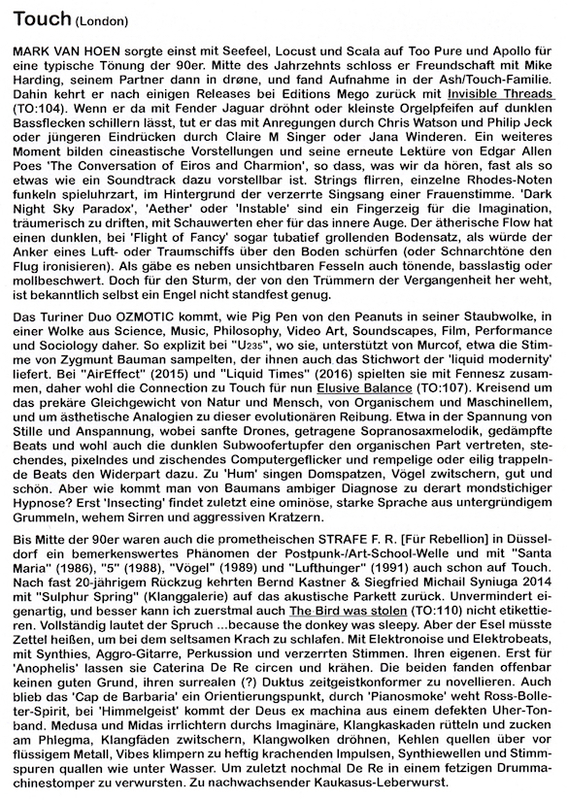 Mark Van Hoen’s latest album is the result of a series of live performances with other Touch luminaries, such as Simon Scott and Philip Jeck, that he participated in all throughout 2016. This experience manifests itself in a somewhat different than expected way on Invisible Threads, because this final result is purely a solo work. However, it was these previous collaborations and performances that lead to Van Hoen approaching the record from different perspectives and with a variety of instrumentation, resulting in a diverse, yet overall uniform sounding album. While he intentionally avoided using one of his staples on Invisible Threads, vintage analog synthesizers, Mark did utilize modular synthesis throughout the record. Right from the opening of “Weathered” this can be heard: a rich bed of layered electronics set the stage as he patches in some occasionally shrill tones and a pleasantly dissonant crunch, but with a tasteful level of restraint. For “Opposite Day,” he follows a similar pattern, blending mostly elegant ambient electronics with just the right amount of heavy low end vibration. Even some conventional piano sounds appear on “Aethēr,” culminating in a melodic progression that continues and builds throughout the piece. The combination is one that, once a bit of dissonant ambience comes in as a contrast, makes for a rather conventional, song-like sounding piece of music. The shimmering, sustained electronics that are the focus on “Dark Night Sky Paradox” also have a nice pleasantness to them, and fits in with Van Hoen’s experience doing sound design for films given the end result’s film score mood. Later, a bit of drama comes from the heavy electronics that enshroud “Flight of Fancy” and, with the piece’s dense and brittle electronics have a cinematic quality as well. Like any good album, however, Invisible Threads has some more sinister moments to balance out the more pleasant light ones. The varied electronics and processed field recordings on “The Yes/No Game” make for a different sounding piece of music, one punctuated by a sense of bleakness in its light drift. Compared to many of the others here it is a more sparse mix, but what is there carries a significant amount of emotional weight. The album closer “Instable” also especially stands out with its ghostly haunting sound. There are some large electronic swells throughout, but Van Hoen blends transient layers throughout like passing spirits, resulting in a spectral, ghostly closing to the album. 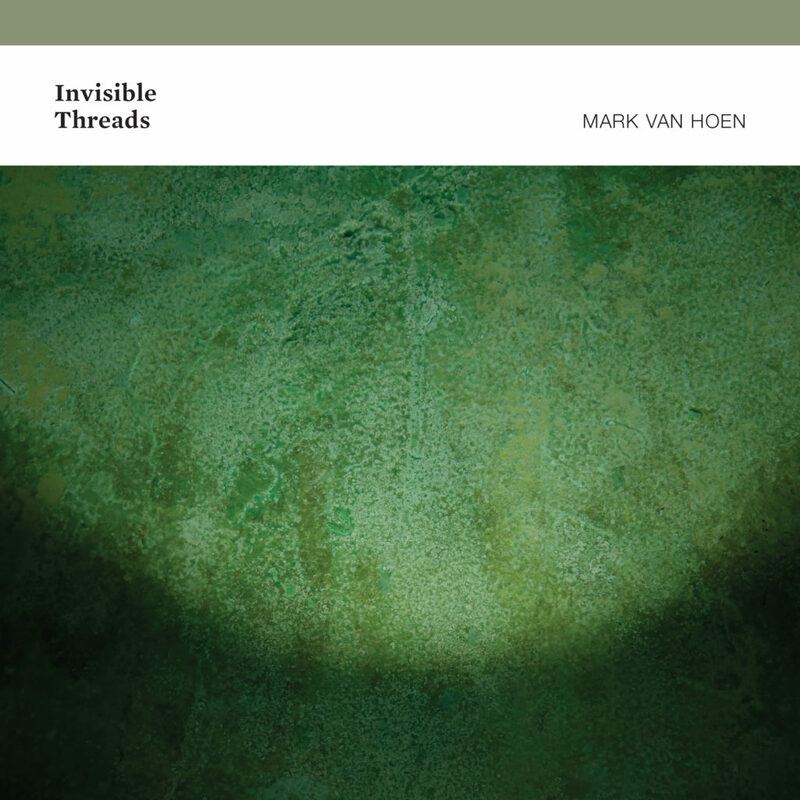 Former Seefeel member and sometime Locust — as well as having tucked numerous productions in his own name under his belt — Mark Van Hoen continues his long line of detailed, often intense ambient electronic albums with Invisible Threads. In the twenty-plus years he’s been making music, Van Hoen — stellar himself, of course — has kept some equally illustrious company; of late, on a string of live dates stretching back to 2016 he shared a stage with Philip Jeck, Simon Scott, Kara-Lis Coverdale and Pye Corner Audio. Waves of sound — in both the literal and metaphorical senses — wash over the listener to create a feel of ebb and flow; it’s an immersive as well as fluid listen. The track ‘The Yes_No Game’ is a good example of this, as a woman’s voice, previously obscured, periodically emerges as the swells subside; it’s a call, an invitation to plunge into the waters. I could happily listen to this track alone on repeat for hours… ‘Opposite Day’ starts gently with some pleasing dissonances, sub-aquatic rumbles of bass and some delicate strums and harmonious chimes. It’s all very pleasant but don’t expect to be lulled into slumber; there be darkness here. Sweet, reassuring darkness. Per Mark Van Hoen il graduale ritorno a pieno regime sulla scena sperimentale non è stato la rivendicazione di un posto riservato, quanto piuttosto la risposta a una necessità di fare tabula rasa e ripensare radicalmente le modalità espressive già adottate con profitto a cavallo tra i due secoli. 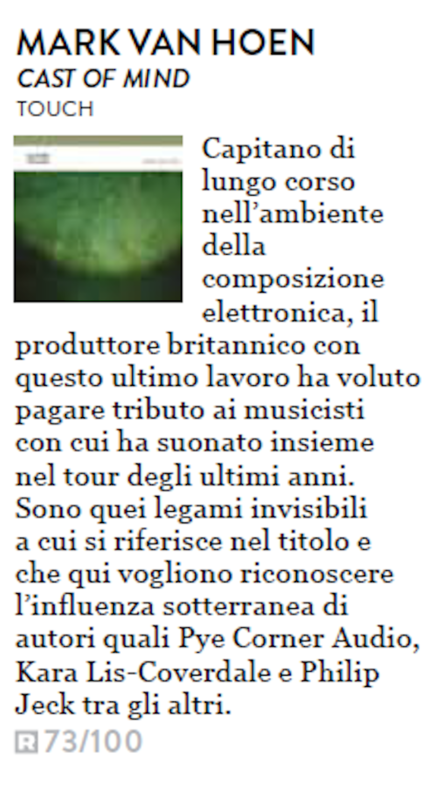 In seguito alla riedizione in doppio Lp di “The Last Flowers From The Darkness” (Touch, 1997), a ridosso del suo ventennale, il sound artist londinese ha lavorato a ben tre dischi in tre anni con Mike Harding, co-curatore di Touch, per il progetto-laboratorio Drøne (“Reversing Into The Future”, “A Perfect Blind”, “Mappa Mundi”). A quest’ultimo e a molti altri sodali si ispirano e sono dedicate le composizioni confluite in “Invisible Threads”, titolo riferito propriamente ai sottili legami e alla comunanza di visioni artistiche che si instaurano tra autori di simile sensibilità ed estrazione culturale. Composto e registrato nella seconda metà del 2016, l’album del ritorno su Touch prende notevolmente le distanze dalle tematiche (post)apocalittiche degli umbratili concept a nome Drøne, inserendosi piuttosto in quel filone ambient che negli ultimi anni ha visto un notevole ampliamento dei suoi accoliti, facenti capo a label indipendenti più o meno storicizzate quali Room40, 12k, Dragon’s Eye e Cyclic Law. Van Hoen cita esplicitamente influenze vecchie e nuove, su tutti Chris Watson e Philip Jeck – le brumose stratificazioni sonore di quest’ultimo sembrano suggerire il mood di diversi momenti – ma anche due più recenti conferme al femminile, Jana Winderen e Claire M Singer, le cui affascinanti intersezioni con la scrittura neoclassica e il field recording portano avanti onorevolmente l’inestimabile eredità Touch. Dopo un tour illuminante, collaborazioni importanti e l’intermezzo di due album con lo pseudonimo Locust, Mark Van Hoen fa finalmente la sua ricomparsa a distanza di 6 anni, da quell’ultimo lavoro “The Revenant Diary” (2012) che lasciò un po’ tutti con la bocca aperta. I tagli techno del passato si sono evoluti in una sorta di granulosità molecolare e l’asciutto design dell’opera portano ad una necessaria volontà di ispezione al microscopio. Non è un semplice disco drone con oscure correnti sotterranee. Ci sono molte profondità sotto la sua superficie: una nuotata sicura e piacevole nonostante i segnali di pericolo (‘Danger’ e ‘Hidden Currents’), perchè Mark è un bagnino addestrato ormai, che sa curar bene ogni forma di claustrofobia. Le onde sonore di “Invisible Threads” – sia letterali che metaforiche – sgomberano la mente dell’ascoltatore creando una continua sensazione di flusso e riflusso quasi catartico. Un ascolto fluido, coinvolgente; un viaggio dentro una foresta che non nasconde insidie. Il brano ‘The Yes No Name’ è un buon esempio in tale senso: la voce di una donna, precedentemente oscurata, emerge mentre le onde si abbassano. E’ una chiamata, un invito a tuffarsi nelle acque fluviali che abitano questi luoghi paradisiaci e misteriosi. Un’oscurità dolce e rassicurante. Pericolosamente rassicurante. Le nebulose soniche e agitate sono altrettanto rapide e distraenti, infatti. L’ispirazione dell’album è impostato principalmente sul racconto di Edgar Allen Poe: “La Conversazione di Eiros e Charmion” che ha riletto durante il tour. L’album è in qualche modo, quindi, concepito come la sua colonna sonora. Considerando che si tratta di una sorta di storia dal sapore fantascientifico, che mescola mitologia e catastrofe indosserei – prima di polliciare sul play – le cinture di sicurezza. I toni bassi, ronzanti e aleggianti ondeggiano attraverso le sette composizioni sottili dell’album. Strisce, intrecci, frammentazioni di danza leggera attraverso queste distese fredde e desolate che spesso si confondono. Anche il silenzio sembra fornire una parte integrante dell’esperienza di ascolto e contribuisce alla forma dell’intero arco dell’album. L’ho ascoltato di sottofondo e con le cuffie: in entrambi i casi ha soddisfatto quei criteri di atmosfera che influenzano e colorano l’umore piuttosto che essere una carta sonora da parati che scompare nello sfondo inosservato.